Need String Lights that Last Longer but don't cost the earth? Welcome to the Next Generation of Outdoor Solar String Lights. PowerBee Endurance ® Solar Powered String Lights, Weatherproof, Work All Year Round in UK, USB Charging Ability, Easy Change Strings, and Multi Function Operation. Our Endurance String Lights Last Longer than ANY other in their Price Range, we design them to work in cloudy weather which is more common than not in the UK! 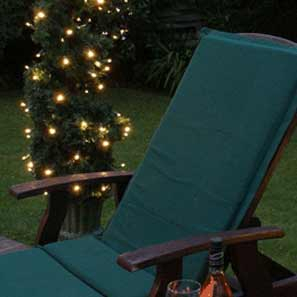 Its always worth spending a little more and having something that will last, Invest in Solar Lights that actually work when You need them..
Wrap Solar String Lights on trees and bushes with ease, enjoy Lights on Parasols and Fences, add magical Led Strings to Your Garden and have Twinkling Lights All Night. Need Your Lights on All night for Christmas, Party, Birthday, or New years Eve, with Dual Power Charging you can rely upon our Lights when You need them. Our Solar Lights are a cost-effective, practical Alternative to Mains. Customers who purchase from us, come back and will buy from us again and again, we have customers who have been with us right from the start some 10 years ago. We look after our customers and listen carefully to what they say. If you would like more information, on any of the solar products that PowerBee Ltd can offer, please either call us on 0845 094 8821 or email us using the contact form provided on the contact page. We have been specializing in Solar Power for 10 Years in the UK and are leaders in the field. We use high efficiency solar cells, and quality materials, our manufacturer is ISO certified. The PowerBee Endurance ® range represents the Next Generation of String Lights Powered by Solar.